Markets are trading with a lack of conviction characteristic of recent P/L distress and an upcoming event risk of the type that generally emasculates risk appetite. Funny enough, that's exactly the situation we're in, so a bit of meandering to and fro isn't the most surprising (or worst) thing in the world. Equally funny was PIMCO's announcement that they had brought on as advisors Messrs. Bernanke, Trichet, and Brown- or, as many might call them, the Three Stooges. Putting aside the issue of public sector figures criticizing the financial industry whilst in office and then accepting its filthy lucre afterwards, one can only hope for PIMCO investors that they're not using Bernanke to call the housing market, Trichet for developing optimal policy models, and Gordon Brown for market timing gold. One market that is not meandering and clearly bears watching is crude oil- not just for commodity punters and high yield owners, but also for those friendly macro analysts who've been expecting an uptick in inflation once the y/y change in crude oil stops dropping like a stone. 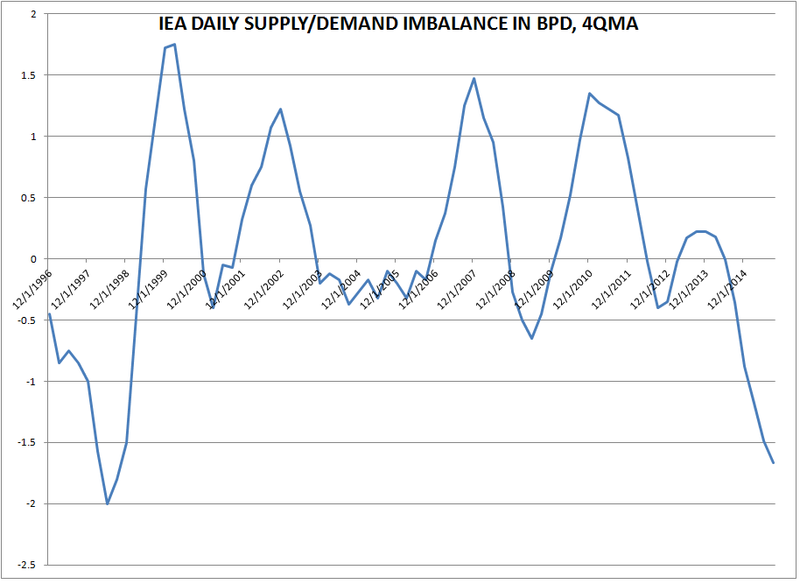 The problem, of course, is that if crude itself does not stop dropping like a stone, neither will the y/y change. If that happens, then there will doubtless be a few sneaky views on upside inflation surprises for next year that will have to get tossed out of the window. 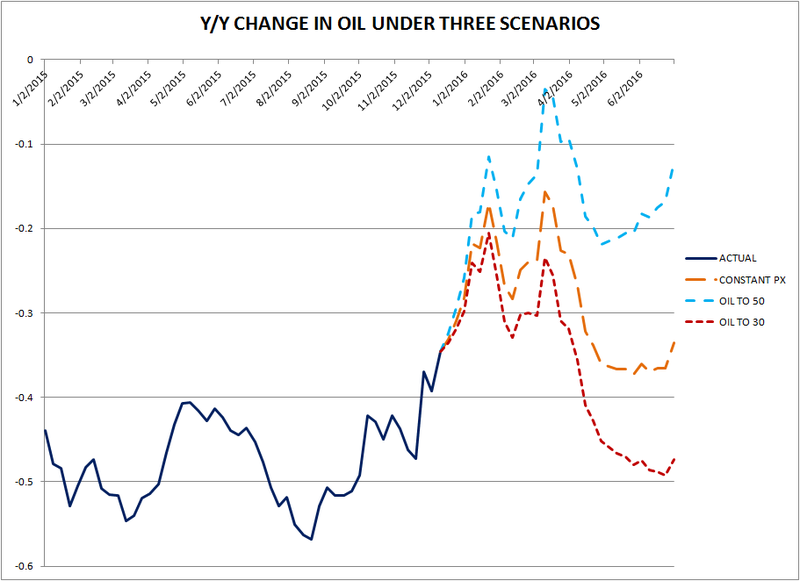 The chart below plots the dynamic, including forward projections based on three scenarios: unchanged WTI, WTI goes to $30/bbl by mid-year, and WTI goes to $50/bbl by mid-year. As you can see, over the next four months or so base effects will be very favourable almost regardless of the spot price; thereafter, however, there could be trouble again. What seems close to indisputable, however, is that monetary policy cannot "solve" this "problem", since it's a function of good old supply and demand. 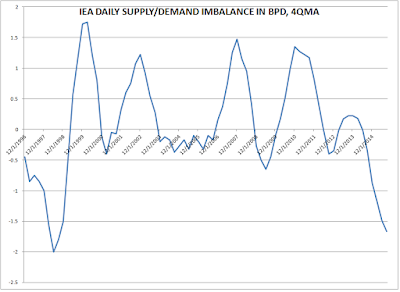 Indeed, if we look at the IEA estimates, we find that the one year average level of daily oversupply is the largest 1999, just after the infamous drop to $10/bbl. Small wonder energy sector equities and credit have been mullered! 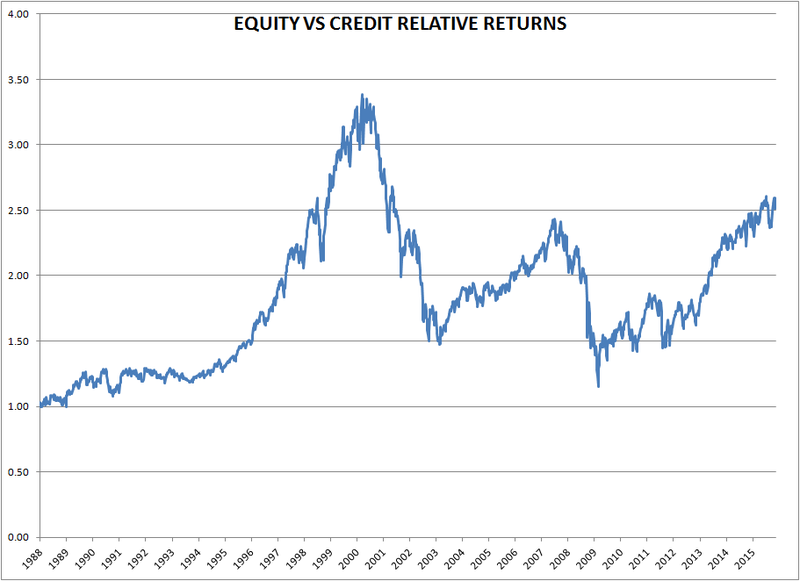 Speaking of credit, it seems like we're now at the stage where it becomes important to think in terms of the relative value of equities and credit, insofar as in the US the latter remains on the back foot while the SPX and NDX at least sail merrily along. Such divergence can persist for a while, particularly insofar as the components of credit and equity indices are far from identical. That being said, there is a wealth of historical precedent to suggest that where credit leads, equities generally follow. Now, what's really interesting is when we try to identify some sort of boom/bust line. Over the entire sample, the average annual total return of the SPX has been 9.78%. 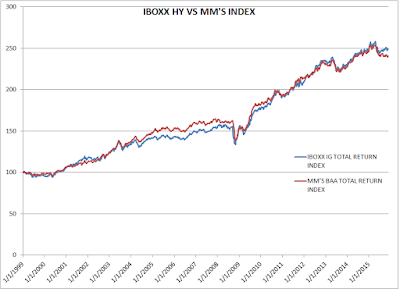 When this relative value metric is below 2, the average one year forward return is 15.4%. When the metric is above 2, that average forward return is -0.84%. We currently sit at 2.58, which is in the 92nd percentile of all observations over the last 28 years or so. This is far from an exhaustive analysis, and there are of course industry- and company-specific nuances that can impact relative pricing. Nevertheless, at first blush the analysis seems to confirm the unease that Macro Man and perhaps others have felt about the ongoing resilience in equities in the face of the retreat of credit. It might be a little early to suggest owning credit at the expense of equities; at the moment, in the US at least, Macro Man is hard-pressed to find compelling reasons to own either one. Well, I almost fell like I have to pay a commission on this one MM ;). Just to be clear; there can be little doubt about this. "What seems close to indisputable, however, is that monetary policy cannot "solve" this "problem", since it's a function of good old supply and demand." The question is of course whether they react. The recent lurch lower certainly will make things very interesting next week, but Yellen has to move I think. Meanwhile on credit and equities. Well, yes, yes, and double yes. This has been a recurring theme here, and it all looks very odd. I think the explanation, for now at least, is pretty simple. Low energy prices --> boost to consumers --> boost to services/non-manufacturing --> buy everything outside commodity and energy land. Incidentally, this is the same story in the macroeconomic data, and my assumption is that the market has been trading this story. You know, FANG and all that ;). Now, it is of course possible to write a sequence of arrows which looks much more downbeat. Commodity unwind ---> HY energy distress ---> distress in EM ---> distress/defaults ---> bond liquidity meltdown ---> global recession. I have been of the opinion for some time that this would be how it ended ... my assumption was merely that we would get a period of reflation where at least some central banks call victory and raise rates first. Maybe not. The thing is ... if you think the cracks are now really spreading to broader financial markets, it is difficult to disagree with LB I think. Buy the long bond because Yellen won't be raising so much as she will soon be forced to think about QE4 to mop up the carnage in corporate bond markets. And the good ol' U.S. duration usually does well. As for Gundlach and Dalio ... yes yes, they're too long bonds for their own good, probably ... well, almost surely :). 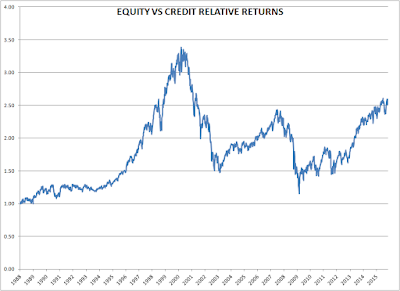 regarding the equity vs credit index ratio, how does it look if you normalise for volatility? equites are the slowest kid in the class...they will align not slowly but all at once. Darn, I was waiting for the fed meeting for a dollar correction to short commodities and EM. 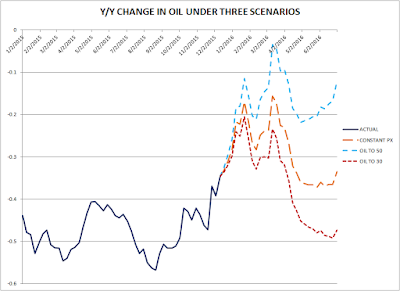 If there is no dollar correction with the fed meet, then it could be a one way trip to NG 1.8, oil 32. It would be a strange irony to see a liftoff and the Fed to say "all is good", and to see the other shoe drop for EM. Australian dollar is a good macrofundamental short here. It has disconnected from oil and iron ore in the last 4 weeks and should be due for a reconnection. Very insightful as always MM - if only your equity forecast model would stop acting so damn bullish, we could all be happy bears! Wait, what was that about the magic 8 ball? JK of course - agree with your comments yesterday on Dalio et al talking their books - I am intrigued by the possibility of a simultaneous high volatility sell-off in bonds and equities at some point at some point in our lives since it poses the most painful scenario for all ilk of market participant, but perhaps the time isn't now. On a different note, now that it increasingly looks like Trump is for real this country is in for a pretty dark chapter - don't think its not possible. Second, it seems to me that lots of capital has been spent on buybacks and mergers rather than expansion over the last few years. To me this seems a shaky way to start a recession. Third, medical care costs have been passed on to the worker, and even the young who are healthy. OK, that is US policy, but it has blunted the effect the young are having on the economy, and I wonder what they will have to spend if there is a recession in 2016. 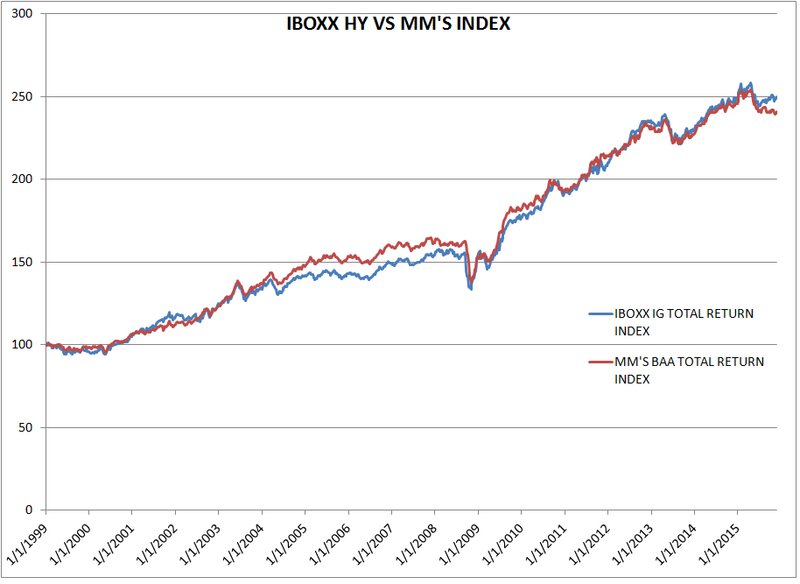 I have been waiting after my daily investing to have another chance at an inflection point, this time to short equities. I think if the DOW breaks 17K, I will mortgage the dog and bet on red....(and buy more Tums)...:) Still patient, but a little less sleepy. CV, it will be interesting to see if the FANG narrative changes. Already health care seems to have lost its mojo and no more tech earnings for a few months to bail out sentiment. You said: "monetary policy cannot "solve" this "problem" ". Well, loose monetary policy sure as hell helped "create" this "problem". Coupled with a big fall in the wages component in western consumed manufactures, ultra low interest rates have helped all those little accountant spreadsheets to make every investment and increase in capacity worthwhile. We are now going to reap the fruits of all that overinvestment in commodities and manufactures with a loss of pricing power. Really, who are these guys. "Apple now has more than $100 billion of corporate bonds in its portfolio, representing almost half the cash on its balance sheet. With that scale, Apple manages more fixed income assets than Jeffrey Gundlach's Doubleline Capital Management, which reported $76 billion of assets under management as of June 30. In fact, just the most recently quarterly increase in Apple's cash position, $3 billion, is more than double the total assets managed by Bill Gross in his Janus unconstrained bond fund." @washedup However senseless we think Trump's statement is, he is willing to go to the extra mile to say it to make a group of people feel safe/good. That is why that group of people are willing to stick to him. But enough of politics. Agree @abee crombie on CAD. CAD has done this huge deppreciation by the end of the year since 2013. Is USDCAD going to repeat this pattern and reach 1.5 by the end of Q1 2016? Last year (from the end of 2014 to Q1 2015) it was caused by/correlated with oil dropping from $100 to $50. Oil is at $37 right now. Any thought on this CAD breakout? Real or fake? Washedup: "On a different note, now that it increasingly looks like Trump is for real this country is in for a pretty dark chapter - don't think its not possible." We have been in a very dark period for the last 7 years...just one more to go. "On a different note, now that it increasingly looks like Trump is for real this country is in for a pretty dark chapter - don't think its not possible." It's all entertainment...It's not clear to me that Trump would be worse for the world or hard working Americans than say Bush Jr.
All this politically correct sh*t about Trump being no good, frankly sickens me. It's the politically correct establishment that is responsible for 90% of the ills in society. I hope Trump wins, and I hope he enacts all his most contentious policies. Time this country had some real changes. Trump is too liberal for my liking. Can I request that we leave the political commentary for another forum please. I really don't want this to be a place where there is discussion of the relative "merits" of any of the presidential candidates. This is going to be an exceptionally long election year ahead, if you think that we are still in the earliest stages of the primaries. No doubt there will be many opportunities and a variety of on-line forums available for "debates" on the candidates. For now perhaps we can confine ourselves to debate on the relative merits of the following Fed movie titles: "One and Done", "Four off the Floor" or "The Full Carney"? Gundlach Asks Why Hike Now? Oaktree Capital Group LLC, the world’s biggest distressed-debt investor, has the most investment opportunities since Lehman Brothers collapsed, according to co-Chairman Howard Marks. “Post Lehman there was too much to do, and now there is again,” Marks said Tuesday. “For the credit investor we have our first opportunities in several years. It’s been a long, long time." Nico: DUI is not-cool. You should be ashamed.